Many of the potential runners in this year’s Champions Cup (G1, dirt, 1,800m) at Chukyo Racecourse came off the JBC Classic (dirt, 1,900m) at Kyoto Racecourse on November 4, but some others aiming for JRA’s dirt G1 on December 2, including the Champions Cup defending champion Gold Dream (JPN, H5, by Gold Allure), chose the Mile Championship Nambu Hai (dirt, 1,600m) as their step race. The Mile Championship Nambu Hai at Morioka Racecourse (NAR; National Association of Racing) on October 8 featured not only the 2017 Best Dirt Horse Gold Dream but also Le Vent Se Leve (JPN, C3, by Symboli Kris S), the Japan Dirt Derby (dirt, 2,000m) victor and a potential threat to dirt racing who came into the Nambu Hai with a career record of five wins and a second out of six starts. The race unfolded with Gold Dream, rated right behind Le Vent Se Leve in midfield, chasing the latter as soon the Symboli Kris S (USA, by Kris S.) colt made headway, and then taking control in mid-stretch but ultimately losing out to Le Vent Se Leve by 1-1/2 lengths. Le Vent Se Leve demonstrated the high standard of this year’s three-year-old generation by becoming the first three-year-old to claim the Mile Championship Nambu Hai title. 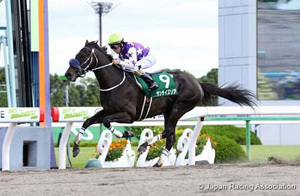 Another quality performance in the coming Champions Cup could make him the first three-year-old in 12 years, since Alondite (JPN, by El Condor Pasa), to claim the dirt JRA-G1 title. 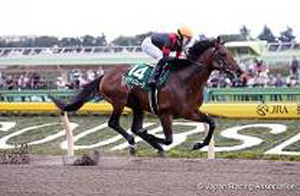 Taking into consideration that the past three-year-old winners – only three including Alondite – competed when the race was run at 2,100 meters at Tokyo Racecourse (through 2007), a victory by Le Vent Se Leve would be an unmatched feat in the race’s history. Gold Dream, while beaten in the race by an exceptional three-year-old, has consistently finished within the top two in five consecutive starts, including his Champions Cup victory last year. He just missed by a neck in the February Stakes (G1, dirt, 1,600m) in his kick-off start this season and then notched two major wins in the Kashiwa Kinen (dirt, 1,600m) and the Teio Sho (dirt, 2,000m), overcoming his past weakness of turning four corners in a single race. 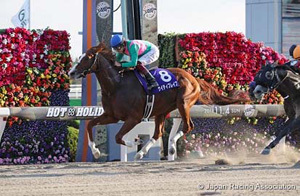 If the son of Gold Allure (JPN, by Sunday Silence) successfully defends his title in this year’s Champions Cup, he would become the first horse since Transcend (JPN, by Wild Rush) in 2010 and 2011 (Japan Cup Dirt) to accomplish consecutive wins in the race. Meanwhile, the JRA-NAR exchange JBC Classic, which is usually organized by regional public racing and held in turns at local tracks, was hosted by JRA for the first time in its 18-year history. The race unfolded as predicted, with race favorite Sunrise Soar (JPN, C4, by Symboli Kris S) racing up front, third-choice K T Brave (JPN, H5, by Admire Max) rated in midfield and second-favored Omega Perfume (JPN, C3, by Swept Overboard) sitting among the rear group. As the race progressed, K T Brave made headway and loomed in contention entering the straight, holding off foes at his heels, and then catching Sunrise Soar before besting a fast-charging Omega Perfume for the win. Sunrise Soar, who managed to maintain his lead deep into the stretch, held on gamely after being overtaken by the winner but Omega Perfume came on powerfully from the outside for the runner-up spot. This year’s February Stakes victor Nonkono Yume (JPN, G6, by Twining) also made a late charge for fourth. 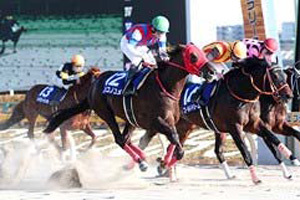 K T Brave, a proven winner in major dirt races such as the 2017 Teio Sho and the 2018 Kawasaki Kinen (dirt, 2,100m), only missed by a neck to Gold Dream in this year’s the Teio Sho. While a prominent dirt runner in NAR races, he had only two JRA wins between his debut and early in his three-year-old campaign until his victory at JRA’s Kyoto Racecourse. The recent uptrend in form could help him improve on his fourth-place finish in the 2017 Champions Cup. Omega Perfume is another outstanding three-year-old along with Le Vent Se Leve, against whom he finished second in the Japan Dirt Derby by 1-1/2 lengths. The Swept Overboard (USA, by End Sweep) colt has registered four wins out of seven career starts, including the Sirius Stakes (G3, dirt, 2,000m) in September, and has finished second twice and third in his remaining start. Sunrise Soar was second in the Japan Dirt Derby last year but was unable to notch a major win in his following starts as a three-year-old. However, his four-year-old campaign has shown great improvement with wins in the Nagoya Daishoten (dirt, 1,900m) and the Heian Stakes (G3, dirt, 1,900m). He validated his renewed form in the JBC Classic, holding well to finish third while the rest of the front runners weakened to seventh or worse. If the Symboli Kris S colt can perform in the same manner over the long uphill stretch at Chukyo Racecourse in the Champions Cup he could be among the top finishers in the race. 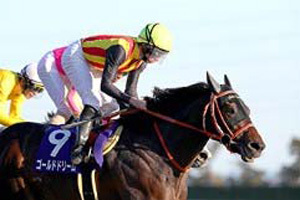 Nonkono Yume is a late closer whose performance depends on how the race develops, so he will stand ready to take advantage if the pace increases with early disputes among the frontrunners and horses press the pace. The Musashino Stakes (G3, dirt, 1,600m), a Champions Cup trial held by the JRA on November 10, was won by Sunrise Nova (JPN, C4, by Gold Allure), who zoomed into contention after racing second-last early but then circled wide into the straight to exert a powerful late charge – the fastest finish over last three furlongs – for a 1-1/4-length victory. It was his second grade-race title after the Unicorn Stakes (G3, dirt, 1,600m) last year. The son of Gold Allure, who has proved consistent throughout this season with three wins and three seconds out of seven starts and a fourth in the February Stakes, is coming off a three-race winning streak for his second dirt JRA-G1 challenge in the Champions Cup. 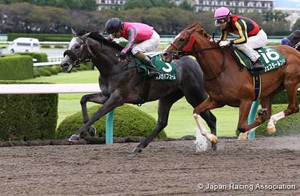 • Hiraboku la Tache (JPN, C3, by Kinshasa no Kiseki), who won the Fukushima Minyu Cup (dirt, 1,700m) on November 18. Westerlund (JPN, G6, by Neo Universe), Queen’s Saturn (JPN, H5, by Pyro), Chuwa Wizard (JPN, C3, by King Kamehameha) and Danon Good (JPN, H6, by Elusive Quality) are substitutes if any of the aforementioned runners withdraws. Pavel (USA, C4, by Creative Cause) of the USA, who will be the first foreign contender since Hong Kong’s Gun Pit (AUS, by Dubawi) in 2015, won this year’s Stephen Foster Handicap (G1, dirt, 1,800m). The promising colt landed his first graded title in last year’s Smarty Jones Stakes (G3, dirt, 1,700m) and is coming off a 10th-place finish against tough competition at a step up in distance in the Breeders’ Cup Classic (G1, dirt, 2,000m) on November 3. The Creative Cause (USA, by Giant's Causeway) colt has faced top-class dirt runners in just 12 lifetime career starts. 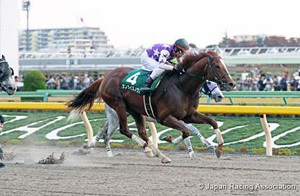 He is trained by Leandro Mora, an assistant to Douglas O’Neil, who saddled Fleetstreet Dancer (USA, by Smart Strike) in 2003 as the only foreign winner of the Japan Cup Dirt/Champions Cup since the dirt JRA-G1 was established in 2000.